When interest rates were zero, the opportunity cost to a corporate treasurer of idle cash balances was zero. No need to invest in money markets, no need to use bank sweep accounts, no need to cash forecast. However, with recent Federal Reserve rate hikes, that has all changed. Indeed, a cash manager not carefully managing daily cash positions today is incurring high opportunity costs. Our recent Novantas research shows that U.S. corporations are holding over $3 trillion in bank balances, with over $1 trillion in ECR-eligible demand deposit accounts. It’s time for corporate financial officers to re-examine their deposit and investment policies and for transaction bankers to update their deposit products. Daily transaction cash generally first resides in a bank demand deposit account (DDA). This is the residual of a company’s transaction activities. Banks “pay” an earnings credit rate (ECR) on these balances, allowing a company to offset its transaction banking fees with these “earnings”. The earnings credit rates are usually well below market rates. That’s because banks view ECR as a convenience to the corporate depositor and also because under Basel III, there is a cost to the bank for holding operational deposits on their balance sheet. Also, banks apply an additional haircut called a balance assessment fee or deposit assessment fee in the range of 10 — 20 basis points to recoup the cost of FDIC insurance, liquidity and other regulatory costs. Several other bank deposit and investment options are available to corporate treasurers. Many banks offer a hybrid DDA, in which balances in excess of those required to cover bank services are paid a real rate of interest, usually in line with the earnings credit rate. Interest bearing DDAs pay rates that are somewhat higher than ECR and hybrid DDA. Corporate savings accounts pay interest that is closer to money market rates but generally limit the number of permitted transactions. Bank time deposits and CDs can be a good option for companies whose cash forecasts indicate that funds are available for a longer period of time. However, there is almost always a penalty for early withdrawal. Bank sweep accounts provide a daily way for the corporate cash manager to have excess cash moved into a higher yielding investment. These include money market mutual funds, commercial paper, CDs or FDIC-insured deposit accounts at affiliate banks. Finally a company treasurer can simply check bank balances daily and directly invest in the capital markets. Often this is done through an investment portal. In the early 1990s, Treasury Strategies classified “corporate cash” into four distinct liquidity tranches — operating, reserve, strategic and stranded cash. Those definitions are now in common use today. We argue now, as we did then, that the first step in managing liquidity is to segregate corporate cash (at least notionally) into those four tranches and to manage each tranche to an appropriate set of investment objectives and policies. As we see from our NDepth subscribers, at today’s ECRs (net of balance assessment fees), most companies are not able to cover all of their treasury management service fees with compensating balances. However, as ECRs rise, earnings will eventually exceed transaction fees. That’s when things get dicey. Unless a company has a hybrid DDA or a sweep account, the return on these excess balances falls to zero. Ouch. Bank Fee Analysis, Ripe with Opportunity — New automated bank fee management solutions are providing state of the art tools and benchmarks. They even read PDF bank account analysis statements and avoid messy EDI 822 files. To save time and money, you can now just drag and drop. Understanding Your Bank Fee Analyses — Bank Account Analysis statements are daunting. U.S. companies spend $20 billion per year on transaction banking services, yet the bank services billing statements are indecipherable. Earnings Credit Rates Rise at Uneven Pace — Getting an allowance on your residual bank balances can be a nice source of income. Our NDepth earnings credit rate benchmarks show wide variances for the third quarter. 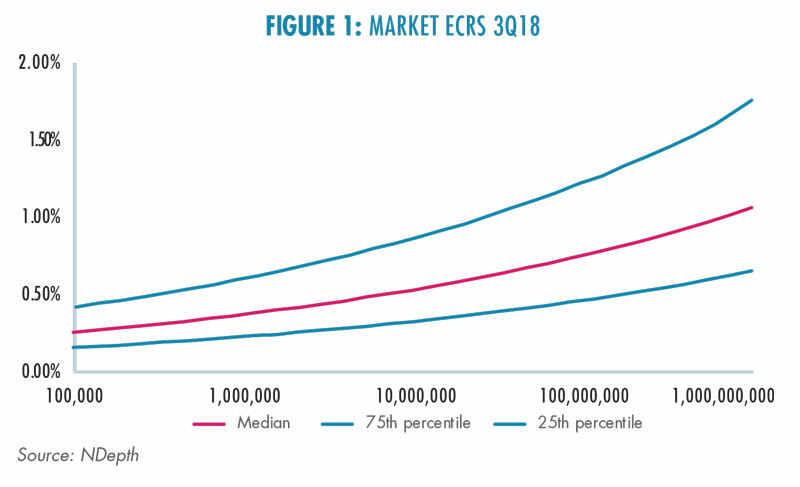 Insurance Company Earnings Credit Rates Lag Market — Although the ECRs for insurance, real estate and nance com- panies are about the ECR market average, they still are considerably lower that comparable money market rates, including rates on money market mutual funds. Healthcare Earnings Credit Rates Lag Market — ECRs are below the average rates banks pay to other customers. This is exacerbated by balance assessment fees which depress rates to almost zero.